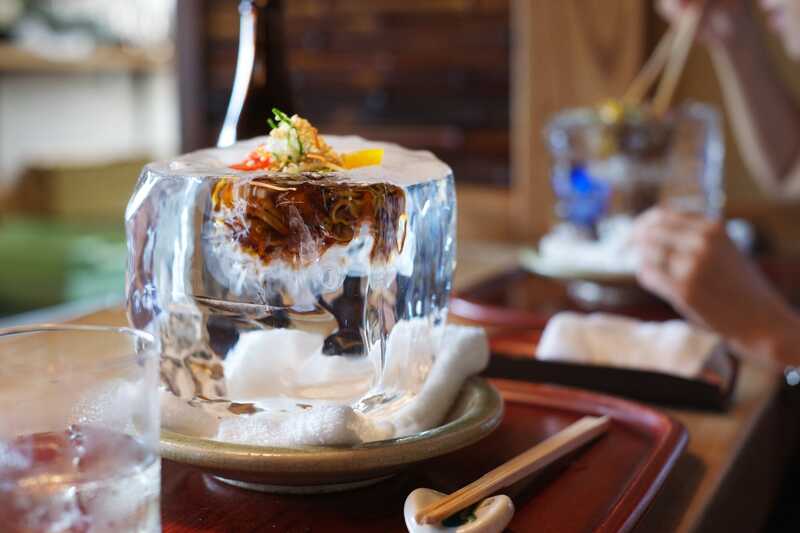 Tempura Matsu, a restaurant in Kyoto, Japan, serves their noodles in huge blocks of ice, and Japanese diners are going crazy over it. To make the ice bowl, the chefs take a huge block of ice and scoop out a portion to make a small bowl. Then they pour hot broth into the bowl, which slowly melts the ice, submerging the noodle soup deeper into the ice block. The dish is beautifully presented, and people can’t stop posting Instagram photos of it. According to Rocket News 24, the most popular noodles are inaniwa udon, made from mugwort and served with wasabi and a raw egg yolk. Tempura Matsu believes in cooking seasonally. In the spring, they serve sakura cherry blossom noodles in the block of ice.